A 24 hour emergency replacement glass company may not necessarily be available to perform an emergency window repair. For this reason you may consider calling an emergency board up service, or several emergency board up services. There are times when a 24 hour glass repair company just will not respond no matter how many times you call them. If this is the case, call one of the many board up companies in the Los Angeles area to boardup your broken window until glass repairs can be made. Glazing or broken glass repairs need to have a window board service performed if the broken glass is tempered and the glass may need to be ordered. Emergency boarding up services are springing up all over the place. You may find one listed under a storm damage company heading because boarding up windows is a form of weatherizing a building especially after fire damage occurs. Also damage restoration contractors will utilize a window board up service if an emergency glass repair would not be feasible at the time. Boardup services usually are utilized before a commercial glass repair can happen due to replacement glazing scheduling. Vacant properties in distressed areas can be hazardous. For this reason a City ordered board up may state that you board up the house, and install a chain link fence to a City board up Spec. An emergency window repair is usually not on option in this case. 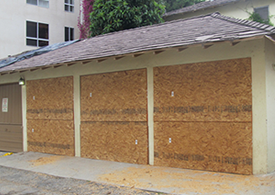 So you may either attempt boarding up all windows and doors yourself, or look for boarding up services in your area. Boarding up windows should be done by a qualified Board up company. Board up window companies are available 24-7 to answer your non emergency or emergency boardup questions. Give us a call and find out. TheBoardUpCompany.com is the only boardup company that you’ll need. Call us for all of your non emergency board up, or 24 hour emergency board up service needs.